Classic charm. Available in either blue ocean or antique ocean, with a hand-covered map, this 20" diameter illuminated globe is mounted on a striking hardwood base finished in walnut. 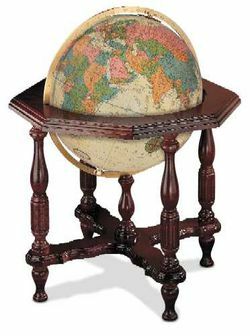 Classic design details, solid brass engraved meridian, and touch-on light control make this globe an appealing element of any traditional decor.